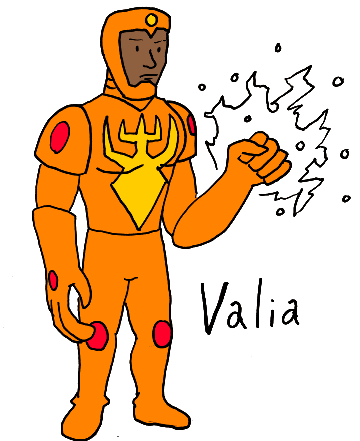 Valia of the Astrolympians is the space god of courage. Great and powerful, she appears on Earth to help the downtrodden in their time of need and to make the oppressed capable of challenging tyrants. Long ago, Valia’s father, the Great Genitor, fought against his ancient brothers, the Emptinesses, for the sake of the universe. Genitor was wounded, he slumped over and his blood pooled around him. Genitor felt defeated until, rising from his blood, Valia appeared to aid him in his fight. Together, father and daughter were powerful enough to banish the Emptinesses to the Outer Places. Genitor now had space in which creation could occur. You can’t really tell in my drawing, but Valia would have the facial appearance of a black woman. Generally, if a cosmic being in comics has a humanoid appearance with a human skin tone, they look white. Why continue that trend? Anyway, if I told stories of Valia, I’d try to find some balance between old school mythological, gods who appear and inspire mortals (by posing as humans and such) and comic style gods, who fight everything always. 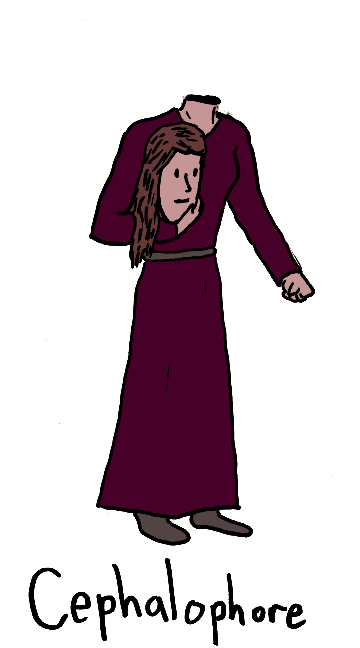 Though beheaded, Miriam Dunville is not dead. She can not only walk and talk as well as ever, she’s actually stronger, faster, and more agile than she ever had been before. Though Miriam has no idea how she managed to survive, or how she still does, she has decided that her continued existence is a miracle and, as such, she must do everything in her power to deserve that miracle. In addition to attempting to solve the attempted murder that left her like this, Miriam takes the time to help any and all she sees in need. It is, to put it slightly, not easy to fight crime while holding your own head. Luckily for Miriam, she is able to swing herself by her hair or throw her head at criminals with either feeling pain or taking damage. This is the second, at least, superhero I’ve created who rams their face into opponents. What is that about, PDR?